The Los Angeles district of San Pedro, California, is a place you have to want to visit. It is not on the way to anywhere. The community is literally, if not figuratively, at the end of the road. San Pedro clings to the side of the hill and to the past. 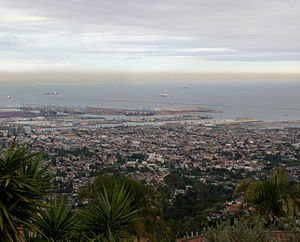 It rests on the south side of the otherwise very posh Palos Verdes Peninsula. The small working class enclave is a place that the often ridiculously trendy Los Angeles seemed to forget a long time ago. San Pedro hasn’t yet surrendered its identity to mega malls and large “box” stores. This community doesn’t have a fancy façade masking the ugly banality of a pervasive pop culture that has sold its collective soul to the devil a long time ago. San Pedro’s gritty exterior reminds me of what blues music sounded and felt like a very long time ago. It may not be pretty on the outside and actually appear to be downright dangerous, but if you have an adventurous spirit your rewards will make any initial apprehension disappear. I have always found a great deal of charm and beauty in the community of San Pedro as well as the type of blues music I heard being made their on a warm hazy afternoon this past April. It seems very appropriate that, in a small recording studio tucked into a modest residential neighborhood in this industrial harbor community, late 40’s and early 50’s electric, Chicago blues is being played by two kindred spirits. 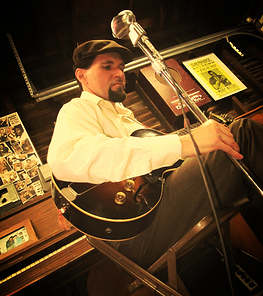 San Pedro’s own Mark Mumea, the guitarist/vocalist best known as a member of the international blues band The Elgins and vocalist/harmonica player Karl Cabbage of the San Diego based band, Red Lotus Revue were making early post war electric Chicago blues. They are two young men who our readers have gotten to know through features that we ran on both musicians last year. They have come together to form a band called, The Silver Kings. In this day and age we are constantly surrounded by more of everything. The world is moving at a faster pace. It seems as if we have to shout to be heard above the din. The blues as an art form is not immune to this modernization. 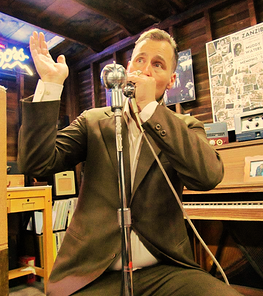 Over the past several decades, the blues has evolved into many things. It has been stretched so far that it is barely recognizable. Today when listening to what is being passed off as blues, we are likely to experience high volume, high intensity and a rock influenced alternative to the real thing. The music has more of everything, except blues. The Silver Kings have taken a courageous and fresh approach and move the music back to a time when popular commercial tastes were not the aspiration of the blues musician. 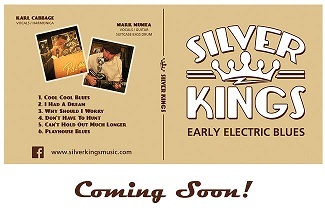 The Silver Kings approach the music from a similar perspective that was the hallmark of the pioneers of early electric post war blues. This band revisits the exciting period of the late 1940’s and early 1950’s when modern recording technology, electricity and blues collided to create music that was very special. This was a period when pure artistic expression ruled the day. It was a time before the commercial youth market came to dominate the record business and hold sway over the musicians themselves. The music that had migrated from the South to the North added a new urban, amplified sound. This brand of blues music that featured restraint, dynamic phrasing, subtlety, nuance and depth is a sound that is rarely heard today. Similar to the way the music was being performed and recorded in its peak, The Silver Kings attempt to capture the essence of that original electric sound. They have found that elusive raw excitement that lies at the heart of this music. With the use of authentic, vintage equipment from this period, they take an understated, minimalistic approach that opens the music up. This style allows for a wider range of human emotion and expression. This gives listeners the opportunity to come to the music instead of forcing the music onto them. Their passion for the original form of the music clearly shines through in every note they play. I sat down with Mark Mumea and Karl Cabbage as they took a break from recording to talk to me about their thoughts on this music and this new band which they hope can breathe new life into an all but forgotten art form. David Mac (DM): What were your ideas or thoughts that went into deciding to form this band? Karl Cabbage (KC): For me it was a chance to work with Mark. I wanted to start digging deeper into the origins of the music. It was an opportunity that was too good to pass up. DM: How did you two hook up? Mark Mumea (MM): Karl and I met for the first time just recently. I actually contacted Karl to see if his band, Red Lotus Revue would be interested in doing a combined show in October while The Elgins are in town. They will be flying in from all over the world and, as we talked about Dave, we are trying to pick up as many gigs as possible in California while they are here and we are all together. DM: Karl, let’s talk a bit about Mark’s musical sensibilities. KC: Mark is not only a truly talented player but he is mature beyond his years musically. As you know, Mark has released two excellent traditional albums with The Elgins. I have a lot to learn about the music and Mark has been helping me. DM: Mark, what does Karl bring to the table? MM: First off, Karl is an excellent front man. He has charisma. He is a very fun and an entertaining personality. He has a great touch on the harp and can play both acoustic as well as amplified styles. He has a strong voice and a unique singing style. His high vocal range allows us to do some tunes that I never thought would be possible. I particularly enjoy his early Rice Miller (Sonny Boy 2) stuff he is capable of doing. He and I have studied many of the same artists, so when we get together it doesn’t take long to get things rolling. Another component to working with Karl is he and I share a lot of the same ideas about how to handle the business side of a band. Unfortunately marketing, booking and making business decisions is part of the equation. This is EXTREMELY important as Karl and I both have young children. DM: Mark, let’s talk about your recording technique and this time machine that we are sitting in which is your recording studio. MM: We use the period reel to reel machines from the late 1940’s and early 1950’s that I showed you earlier. We also use vintage mics and amps of course. I prefer recording with mostly one, sometimes two mics. Most recording done today is done close mic’d. The desire to have everything in the foreground, to me, is the equivalent of someone screaming in my ear. Amplification sounds best to my ears when the sound is surrounded by space. By using a single room mic, it best simulates what you would hear if you were standing in the room at the best possible location. The instrumentation is layered sonically by the proximity to the mic. Recording doesn’t need to be a huge production in my opinion. Like the music we play, I try to take the most honest and direct approach possible. If you’re whole sound is based on tricks, gimmicks and over production then there is no “home base”. There is nothing to hold it together. The mortar is gone and the structure collapses. DM: I suspect your thoughts as it relates to your playing follows a similar philosophy. MM: Exactly! The way in which guys like Jimmy Rogers, Baby Face Leroy and Louis Myers selflessly brought the music together by weaving their subtle but intricate guitar parts underneath the vocals and harp is just beautiful. I just love this approach and I try to mirror that feel every time I pick up the guitar. A lot of times these days, you have guys doing long extended solos, throwing in every note and lick they have ever learned, turning purple in the face because of their over-exaggerated grimaces and all that crap. They lose all contact with the ensemble. They are detached in their own world and essentially stroking themselves. Whatever happened to the interplay between the instruments, tone, dynamics, groove and space? That’s where it’s at for me. A light touch, controlling the tension, holding it right there until the time is right to step out briefly and then return. It’s really a lost art. To illustrate how rare this is, it literally took an International effort to pool together three to four like-minded musicians when I formed The Elgins. DM: Karl, what are your thoughts as it relates to all of this? KC: The music we are concentrating on is from an era when people used to talk to one another and share their stories. The approach is relaxed and loose. I mean it is OK to take a breath between phrases and board the train of thought before you continue. When the music jumps up, it is noticed by way of contrast. DM: Karl, let’s talk about the new EP, which you and Mark are recording at the moment and the EP concept in general that you and I first talked about a couple of years ago. KC: I am very pleased with the way it is turning out. It is just the beginning and a template which we can use to build. I think the highlight of this six track EP is a Moody Jones tune, Why Should I Worry, that is played and sung by Mark. I really dig his poise on that track. I am trying to play my best Snooky Pryor licks behind him. He made it easy by taking the lead and letting it lay in. I dig the bass drum suitcase too. We hope the EP will give people a taste of what we're doing and will open a few doors at small venues, festivals, coffee shops, street fairs etc. and help fund our next release. I think by having 4-6 songs available at a time we can engage our fans more frequently and introduce our music to new fans who otherwise may not want to shell out twenty bucks for a 12-14 song CD. We are talking about putting out a series of EPs in the CD format that are thematically, based on the music of a specific artist that we admire. When we have enough we will put it all together on a full length CD. DM: Mark, what is your goal for this band? MM: Karl and I share a vision. We want to bring real Chicago blues to the west coast. We want to perform, record, and continue to study this great art form. The focus of our study is going to continue to be deep as opposed to wide. It might be a narrow “well” but it is endlessly deep and we know we are nowhere near finding the bottom. We have a long way to go. Karl and I have both been playing and studying these styles for many years, yet it seems like we are just now getting to what matters. We also want The Silver Kings to have some flexibility. I will be auditioning some bass players and we want to have the ability to bring that element into our live recordings when the venue calls for it. Karl and I also talked about using a washboard and perhaps other percussive elements that can be used from time to time. DM: What is on the immediate horizon for you guys? KC: My other band, Red Lotus Revue has a very big gig coming up. We are playing on Saturday, May 18th at the upcoming Doheny Blues Festival. I am very excited about it. I love playing with Pete Fazzini, Jimmy Zollo and Kurt Kalker. They are great musicians and really good guys as well. DM: I read someplace that you have another gig later that evening Karl. 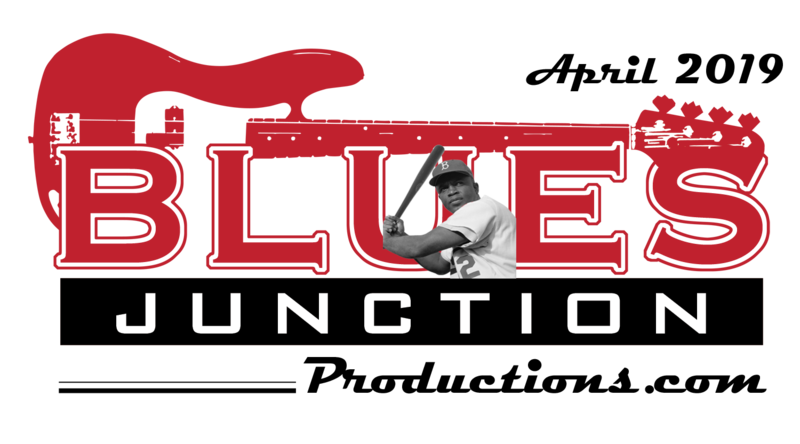 KC: Oh yeah, check this out Dave (laughing) The Silver Kings are making our live performance debut at the BLUES JUNCTION Productions Hospitality Suite at the Doubletree Hotel in Dana Point, directly across the street from the festival grounds. DM: We are going to have a blast guys.